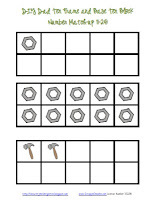 Although I'm not in school to celebrate Father's Day, I realize that some of you may be teaching Summer School or possibly year-round school, so I created an emergent reader to help your students celebrate Father's Day. Use this reader to celebrate do-it-yourself (DIY) dads. 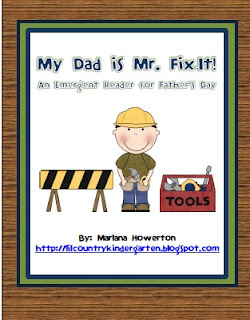 The reader is called My Dad is Mr. Fix-It! Click on the picture below to purchase a copy in my TpT store. Don't forget, it will be on sale through Monday, May 28. 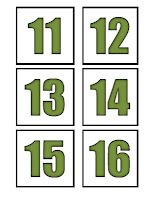 You can also download a DIY Dad Ten Frame and Base Ten Number Match to go along with this book. It's free! 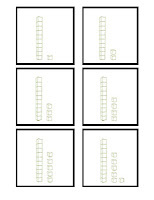 Just click on a picture below to download your copy! I am glad that I found you through the sweet Memorial Day Sale Linky. I am your newest follower. You stuff will be perfect for me when we start up again in the fall! I am hosting my very first linky party and would be honored if you would take a look. Pop in for a visit if you find a moment.